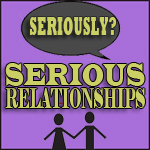 There are quite a few people who don’t know the proper precursors of claiming and maintaining a “serious” relationship. When you label a relationship as “serious” and throw around words like love and marriage and soul mate and “happily ever after”, there are certain criteria that go along with claiming such titles and attributes. Below are a few scenarios that emphasize when a relationship is not that serious. Below each scenario is commentary relaying proper etiquette as it pertains to how one should act while claiming a serious relationship. Chances are if you don’t agree with the commentary, you seriously might not be ready for a serious relationship. You are probably not in a serious relationship when… The person you are with never introduces you to his/her friends. You are probably not in a serious relationship when… The person you are with never takes you out in public, yet when not with you, goes out all the time. You are probably not in a serious relationship when… The person you are with never introduces you to his/her family. You are probably not in a serious relationship when… The person you are with vacations or travels somewhere without telling you. You are probably not in a serious relationship when… The person you are with disappears without explanation for a certain period of time. You are probably not in a serious relationship when… The person you are with doesn’t post pictures of both of you on their social media pages. You are probably not in a serious relationship when… The person you are with always has to get drunk in order to be intimate with you. You are probably not in a serious relationship when… The person you are with never communicates or returns calls/text for the majority of the day. You are probably not in a serious relationship when… The person you are with doesn’t celebrate holidays with you. You are probably not in a serious relationship when… The person you are with consistently makes empty promises. You are probably not in a serious relationship when… The person you are with communicates with exes more then they communicate with you. You are probably not in a serious relationship when… The person you are with chooses you last.